A village just inland from Winterton-on-Sea, north of Yarmouth. 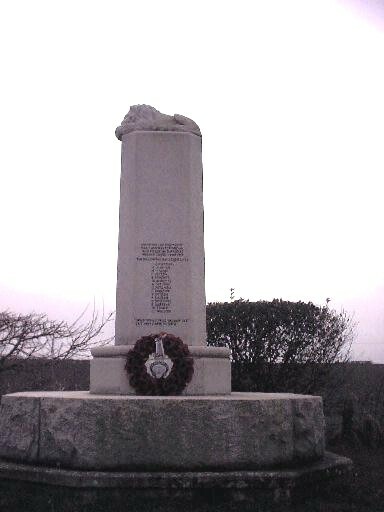 There are two War Memorials in West Somerton. The one in the church has only names from World War One and is transcribed below. An additional memorial stands by the side of the road to the church. Photo below. There are some additional names on the roadside memorial including casualties from World War Two. Private M2/136944. 33rd Aux. M.T. Coy., Army Service Corps. Died Friday 15 February 1918. Born and lived West Somerton. Enlisted Acton. Buried: CERISY-GAILLY MILITARY CEMETERY, Somme, France. Ref. II. A. 16. Lance Corporal 13511. 8th Battalion,, Norfolk Regiment. Died of wounds Saturday 8 July 1916. Age 22. Born West Somerton. Enlisted Great Yarmouth. Son of Frank and Charlotte Elizabeth Jetten, of West Somerton, Great Yarmouth. Buried: ST. SEVER CEMETERY, ROUEN, Seine-Maritime, France. Ref. A. 24. 20. Private 10784. 8th Battalion,, East Surrey Regiment. Killed in action Thursday 9 August 1917. (CD has 9 July 1918). Born Rollesby. Lived West Somerton. Enlisted Norwich. Commemorated: YPRES (MENIN GATE) MEMORIAL, Ieper, West-Vlaanderen, Belgium. Panel 34. Private 28835. 9th Battalion Bedfordshire Regiment. Died Monday 15 May 1916. Age 26. Born Martham. Lived West Somerton. Enlisted Norwich. 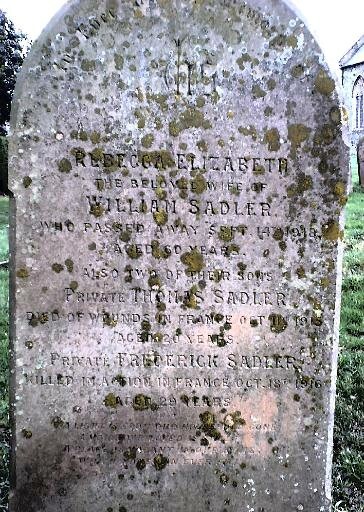 Son of Richard and Frances Knights, of West Somerton, Great Yarmouth. Buried: FORT PITT MILITARY CEMETERY, Kent, United Kingdom. Ref. 1396. Deck Hand 3155DA. H.M. Drifter "Clover Bank, Royal Naval Reserve. Died Monday 24 April 1916. Commemorated: CHATHAM NAVAL MEMORIAL, Kent, United Kingdom Ref. Panel 19. Private 14412. 9th Battalion,, Norfolk Regiment. Killed in action Wednesday 18 October 1916. Age 29. Born Horsey. Enlisted Norwich. Son of William Sadler, of West Somerton, Great Yarmouth; brother of Thomas Henry (below). Buried: BANCOURT BRITISH CEMETERY, Pas de Calais, France Ref. VI. L. 7. Private 14361. 9th Battalion,, Norfolk Regiment. Died of wounds Monday 11 October 1915. Age 19. Born Horsey. Enlisted Great Yarmouth. Son of William and Rebecca Sadler, of West Somerton, Great Yarmouth, Norfolk; brother of Frederick (above). Buried: LE TREPORT MILITARY CEMETERY, Seine-Maritime, France. Ref. Plot 1. Row L. Grave 3A. Private 22920. 7th Battalion,, Norfolk Regiment. Killed in action Saturday 12 August 1916. Age 21. Born Potter Heigham. Enlisted Great Yarmouth. Son of Mrs. E. H. Simmons, of The Post Office, West Somerton, Great Yarmouth. THIEPVAL MEMORIAL, Somme, France. Pier and Face 1 C and 1 D.
Second Hand 937SA. H.M. Drifter "Clover Bank., Royal Naval Reserve. Died Monday 24 April 1916. Age 36. Son of William Thain and Eliza Kerrison Thain, of West Somerton, Great Yarmouth. Commemorated: CHATHAM NAVAL MEMORIAL, Kent, United Kingdom. Panel 18. Driver T4/045157, 35th Reserve Park, Royal Army Service Corps. Died in England 2nd September 1915. Age 38. Born Hockering, enlisted Great Yarmouth, resident Winterton. Husband of Ethel Maria Hacon, of the Street, West Somerton, Great Yarmouth. Buried in GREENWICH CEMETERY, London. Grave 3. "C" A. 4. Lance Corporal 14576971. 7th Battalion Royal Norfolk Regiment. Died on 19th July 1944. Aged 19. 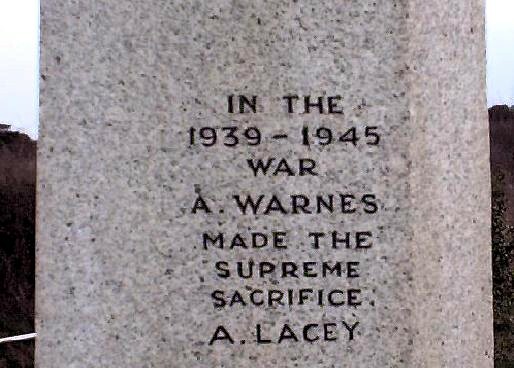 Son of Albert Walter and May Warnes, of West Somerton, Norfolk. Buried: Fontenay-Le-Pesnel War Cemetery, Tessel, Calvados, France. Ref. III. E. 13.